Surprise the gamer in your life for the holidays this year! Both Assassin’s Creed Rogue and Assassin’s Creed Unity are available on pre-order depending on your game system. 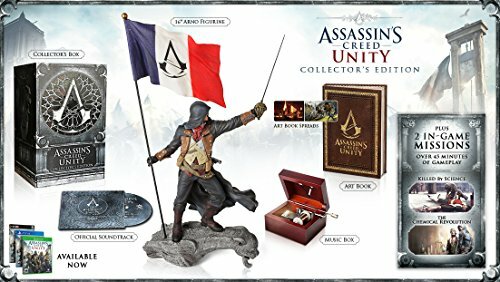 It will make a perfect gift for anyone who loves this game series. Check out the reviews below. In the Assassin’s Creed Rogue game, players will be able to travel as Shay. This character used to belong to the Brotherhood of Assassins. But when a mission doesn’t go as planned, Shay no longer wants to be part of the Brotherhood. Players will get to be part of the change as he turns from Assassins and instead becomes a Templar. Because Templars believe in order and control, even at the expense of others’ freedom to make their own choices, Shay is now an enemy of the Assassins. Now on a mission to destroy those who were once his brothers, Shay possesses extraordinary skills and cunning abilities that make him a formidable enemy. With his skills, Shay also possesses weapons to use against his former brothers as he hunts to destroy them. Weapons like the grenade launcher and air rifle are part of his arsenal. He also has personal abilities that make him dangerous – such as the eagle vision he has. The journey of Assassin’s Creed Rogue follows Assassin’s Creed IV Black Flag. Players will be able to explore the North Atlantic Ocean aboard the ship, the Morrigan. The graphics for the ocean as well as for New York City and River Valley are stunning with the attention to detail. The game is rated M for mature audiences for the language and violence. With a brand new game engine, players can experience the Assassin’s world like never before when they start playing Assassin’s Creed Unity. The characters are realistic in both detail and movement, the action is heavy and the world scenes are a brilliant example of the game designer’s attention to game play. Players will get to experience cities, interiors and missions as a single Assassin or with others. The Master Assassin has the ability to be customized by the player. That means that you can pick out the clothing your Assassin will wear as well as his weapons. But on top of all of that, you’ll also get to decide what his individual skills will be. What this does is it gives the players the opportunity to create a number of possible deadly skills for his or her Assassin character. The game boasts full motion control. This gives players the ability to let the assassins easily scale walls and more. With added features such as stealth mode, this game is a must have. It offers better combat ability and the fighting modes are more realistic. Besides the one player mission, gamers also have the ability to connect with as many as four online players through Xbox Live to create the ultimate fighting team. This allows players to work together to complete missions.